Since a few months back, I tried my hand at teaching. Baking that is. I like to try and bake different things, but when it comes to teaching, I thought I had better to stick to what I am better and more familiar at. After all, I don't want the students to come and end up learning nothing or I end up making a flop of everything. That will be a waste of everyone's time. So, I tried a few classes with cake pops and cupcakes, which have been very encouraging! The first time I taught, I was a little afraid I would be tongue-tied. But that did not happen and I am really glad. I guess what helps is when I bake on my own at home, I am usually talking to myself all the time anyway (in my mind of course). Rather, when I am alone in the kitchen, I imagine I am Rachel Ray, being able to talk and talk and still make everything look effortless (ha! there, you know my dirty little secret of self-indulgence now). So, in the class, I just make those noises in my head come out of my mouth at a higher volume. 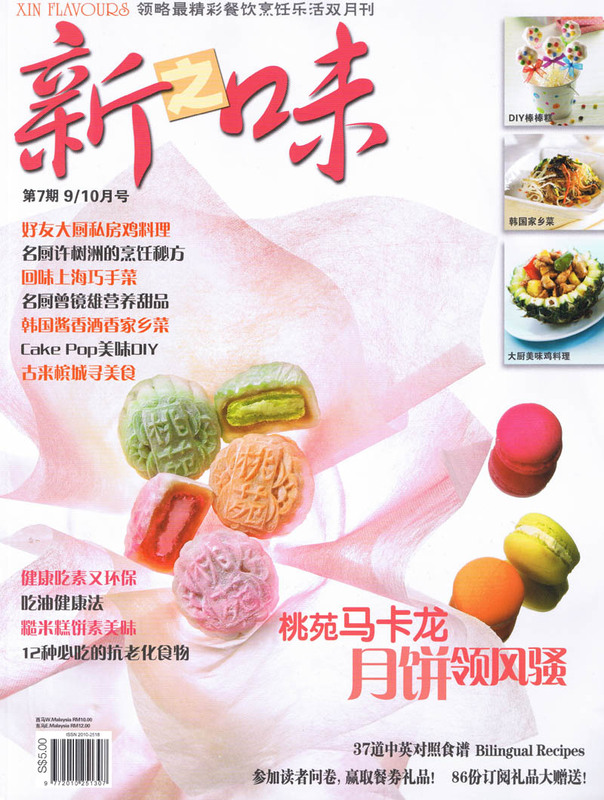 There was also a Chinese food magazine which ran an article about cake pops in their latest issue. And they had me take up a full page *grinning from ear to ear*. They had seen me in a article (on cake pops again) in the newspaper some months back and decided to do an write-up for their readers too, and that was how they got in touch with me. The feeling is weird. I was excited to see the newspaper article come out a few months back. But I was not over the moon or overflowing with extreme pride or anything close. I feel weird looking at myself there actually (I actually requested not to show my face actually). Deep in me, I honestly think lots of more worthy people appear in magazine articles or newspaper, so while I feel it is really encouraging, I don't shout out to all of friends and family to go grab a copy just to see me in it. But, I do want to say the magazine is really great (not because I am in it). In fact, I am an occasional buyer of their past issues, especially when I see recipes I can try out. There are a lot of recipes in it for people to try out at home. And those are all very do-able recipes. Recipes which do not require sophisticated equipment or skills. Oh, and I am always attracted by their contest prizes (I know, I am cheapskate!). But I can't resist the urge to have a chance to win Le Creuset sets, in purple. I bet you can't too, can you? Come on, don't kid yourself. Enough of that teasing, this is the the magazine cover - the Sep/Oct issue of Xin Flavours magazine. There's a writeup on macarons too and I'm so going to try it one day. I have not tried it since my first macaron flop. Way to go on getting published!